1000 Friends formed a partnership with The Sixteenth Street Community Health Center and Climate Interactive to hold workshops addressing the use of Green Infrastructure in the Kinnickinnic River watershed. 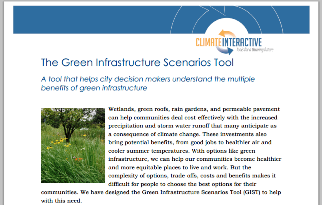 Together, we invited dozens of citizens and leaders from across the watershed to join in a series of workshops focused on using Climate Interactive’s Green Infrastructure Scenario Tool (GIST). 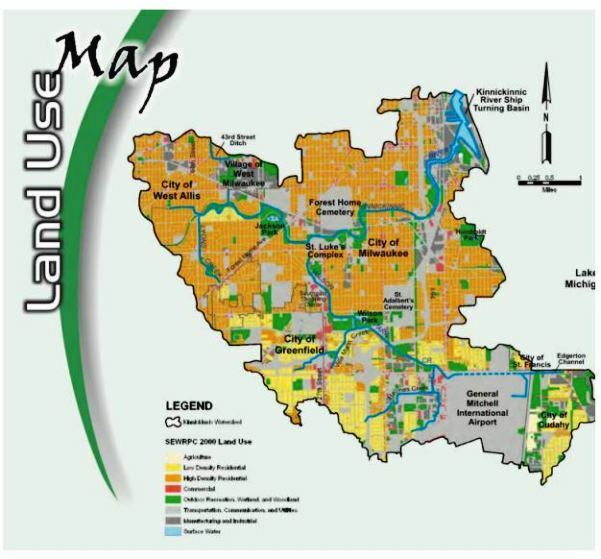 The tool, which was created in partnership with MMSD, is a computer simulation tool used to test potential investment scenarios in green infrastructure. 1. What are the benefits that might arise from a scale up of green infrastructure in the watershed? 2. 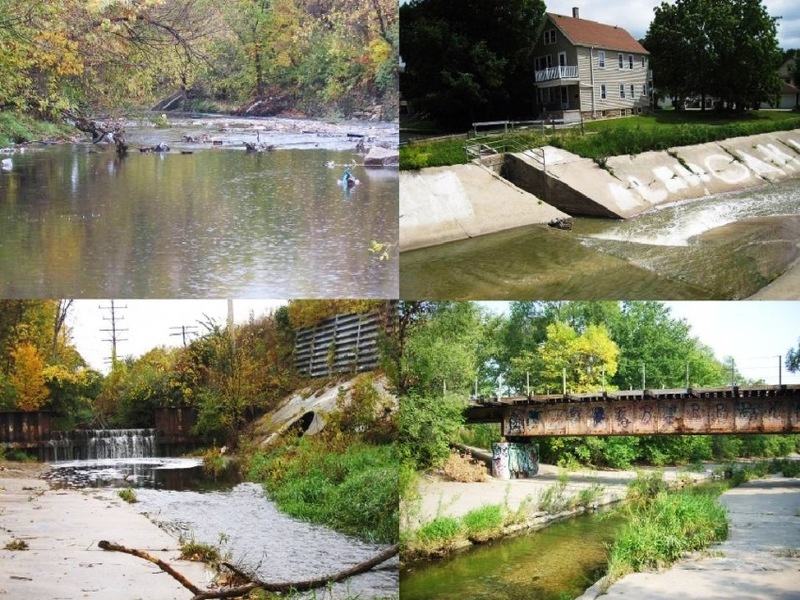 Which infrastructure choices produce the benefits that residents of the watershed would most like to see? 3. What will it take to scale up green infrastructure in a way that would capture those benefits? Why are the workshops important? Instead of addressing these goals one at a time, the workshops brought together people from many sectors, armed with good strategies to influence investment in green infrastructure, steering toward opportunities that produced multiple benefits with greater results for less cost. Green Infrastructure – solutions like green roofs and rain gardens that capture and purify water and provide both social and economic benefit – can address all of these potential problems. Computer decision scenario tools can be used to project future consequences of a number of choices or investments. But, such tools can’t tell a community what combination of goals are of highest priority – only working together can do that. Conversations with key stakeholders indicated that despite many good efforts, green infrastructure didn’t appear to be on the verge of “growing to scale”. While many ongoing projects in the watershed could provide opportunities for the installation of green infrastructure, this greater investment in green infrastructure wasn’t widely shared. These observations led us to focus the workshops on the objective of building a broader, stronger, better informed voice to help bring green infrastructure in the watershed to its full potential. Where should available dollars be invested? What mix of green infrastructure is most desirable? These exercises encouraged people to learn from each other, question assumptions, and discuss their desired future for the watershed. Groups of participants worked to identify opportunities for green infrastructure in each community. Participants pooled their knowledge and created opportunity maps for everything from private development projects to county parks planning to road construction projects. Consistent feedback from participants was that their understanding of potential opportunities increased as a result. Each workshop included speakers with practical knowledge of green infrastructure – from a business owner who had installed a green roof, to a college about to embark on a major storm water management project – these green infrastructure ‘veterans’ were honest in their assessment of what was working well, and what they would do differently the next time. Former employee Steve Brachman at the first GIST workshop. Maintaining current infrastructure would set the people of the watershed up for more flooding, basement backups and combined sewer overflows. 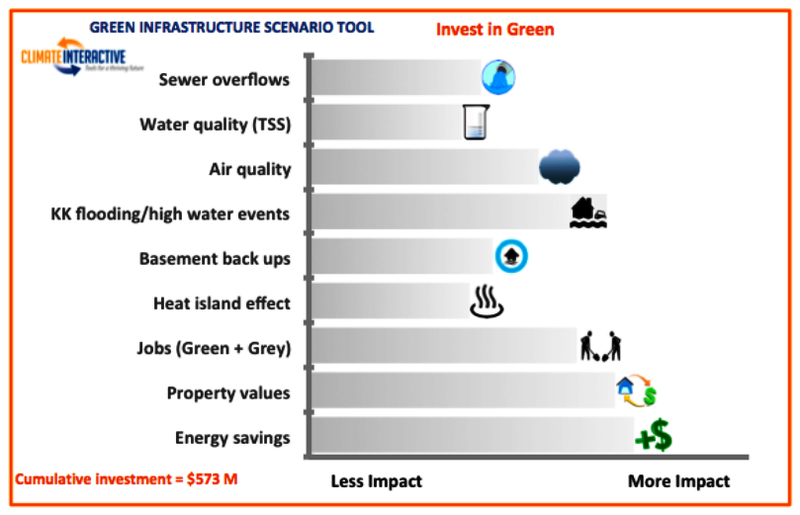 While investment in grey infrastructure might produce slightly more reduction in combined sewer overflows compared to green infrastructure, grey infrastructure investments didn’t deliver as many of the other co-benefits participants cared about. Without increasing advocacy on behalf of green infrastructure, participants find it’s unlikely that its benefits would be realized. Participants recognized that creating their desired future for the watershed would require more collaboration, organization, and a sense of shared purpose. Participants agreed that continued education and outreach would be required to ensure the active participation of each slice of the community. Vegetation-rich types of green infrastructure, such as rain gardens, bio-retention and green roofs produced more helpful benefits than scenarios dominated by permeable pavement. Participants came to understand that it is the living, transpiring surface of plants that reduces the urban heat island effect and improves air quality. The ongoing advocacy of those who champion green infrastructure will be needed to make sure that green infrastructure isn’t viewed as one size fits all. The appetite for stories from the field seemed to indicate that there is a need for more learning about green infrastructure and for forums where people can ask for and offer support and resources, and where leaders in fields as diverse as health, jobs, and environment can support and learn from one another. Interviews with participants after the workshops demonstrated that many people have adopted the framing of co-benefits in thinking about the question of “green vs. grey” and many were even applying that framing to other issues in the community. In this way, the idea of co-benefits has provided a common language and reference point for thinking about investments, policy and priorities. In the final workshop participants strategized about how the insights from the workshops could influence planning and decision making about green infrastructure in the watershed. Participants were carrying the multiple benefits of green infrastructure forward in their roles. 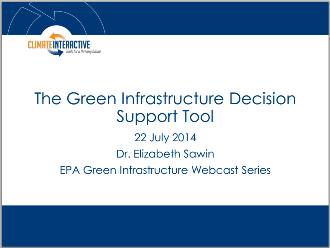 Leaders in Green Infrastructure education and outreach are now equipped to use GIST. As a result of these workshops, Sixteenth Street Community Health Centers and 1000 Friends of Wisconsin staff are now experts in using GIST and can offer the same experience to other groups of stakeholders. Workshop participants hope to come together in high leverage collaborative projects. The value of sharing lessons and best practices across communities and sectors. The potential for successful projects to bring support to green infrastructure. This work was made possible with the support of the Fund for Lake Michigan and the Surdna Foundation.